It’s comforting to know that whenever you feel the world closing in, there’s always a beautiful stretch of beach that you could retreat to. Imagine leaving all the rushing and problems behind and being free to breathe that warm ocean air because this is how I feel wearing Finn & Co.’s beachy paradise fragrance products. Days are for experiencing their White Sand for a carefree beachy escape in the sun with jasmine, mandarin and marine notes. Gently this fresh, this fragrance has both aquatic and gorgeous green notes that work beautifully together to brighten any day. Nights are where you also will long to be once their Black Sand fragrance touches you. Experience the fading heat of a beach sunset at night as you stare at a blanket of stars illuminating the black sky along your sandy path. With notes of sandalwood, vanilla, and musk, you can feel the mystery and sweet seduction of this inviting fragrance as it sweeps you away. Relatively new, this Maine-based company that was started by a mother and daughter have really taken off. Due to their captivating impression of beach fragrances, I am pleased to say Finn & Co. has expanded their fragrance line to now include both White Sand and Black Sand Fragrance Oils ($42), Luxury Body Creams ($38), and Salt Your Soul Rejuvenating Bath Salts ($28) as well as both in their Warm Glow Scented Candles ($46). Their new scented body creams were such a divine way to moisturize. With their rich formula of shea butter infused with Vitamins A, C, and E and aloe leaf extract, my skin was fragrant and felt silky smooth. Something else that you got to try is their new Salt Your Soul Rejuvenating Bath Salts. This product is made from Dead Sea mineral salts, organic coconut oil, and their fragrance, which makes for a soothing and therapeutic bath. I also love the fact Finn & Co. manufacture here in the United States and are free of paraben, sulfate, formaldehde, phthalate, propylene glycol, or phosphate in their fragrance oils and other scented products . As a true perfumista, I know that anyone that appreciates the allure of an enticing fragrance gift would be thrilled with either White Sand or Black Sand fragrance products. Both are as unique and lovely as those matchless ocean shells you may come across on your journey. 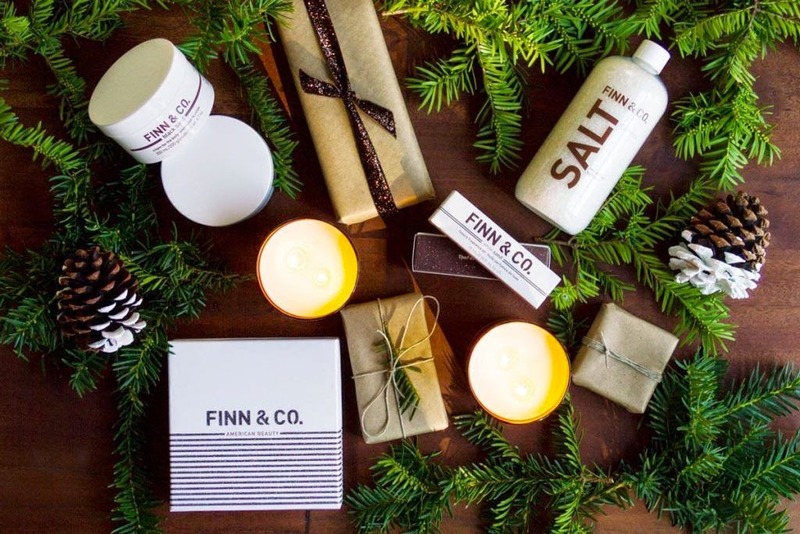 Do visit Finn & Co. and end your holiday shopping confusion with their wonderful fragrance gift products this year! 1st Prize—White Sand Fragrance Oil (10ml), White Sand Body Cream (6.7 oz. ), and Salt Your Soul Rejuvenating Bath Salts (16 oz) for a ($108 value). 2nd Prize–Black Sand Fragrance Oil (10ml), Black Sand Body Cream (6.7 oz. ), and Salt Your Soul Rejuvenating Bath Salts for a ($108 value). Prize: Two (2) winners will receive either the 1st Prize White Sand Fragrance Package of White Sand Fragrance Oil (10 ml), White Sand Body Cream (6.7 oz. ), and Salt Your Soul Rejuvenating Bath Salts (16 oz.) for a ($108 total value) or the 2nd Prize of the Black Sand Fragrance Package with Black Sand Fragrance Oil (10 ml), Black Sand Body Cream (6.7 oz.) and Salt Your Soul Rejuvenating Bath Salts for a ($108 total value)! How to Enter: Please use the Rafflecopter widget. You can return daily and log in again with your email to tweet. Chime for Change is a community of people working to promote education, health and justice for every girl, every woman, everywhere. FINN & CO. believes this is beauty at its best! We want to express our gratitude through these luxury fragrances. I like your recipes and I would like to see pictures of the things you cook. Chime for Change is a community of people working to promote education, health and justice for every girl, every woman, everywhere. FINN & CO. believes this is beauty at its best! I learned that they work with Chime for Change. The Black Sand Warm Glow Candle sounds nice also! On the Finn & Co website, I learned that they work with Chime For Change, a group of people who work to promote education, health, justice, and beauty for all women everywhere. I've learned that this company works to promote education, health and justice for girls and women worldwide. I learned that they have a Black Sand and a White Sand candle. I'd love these! I learned that Finn & Co. is proud to chime with Chime for Change. It is a large umbrella for some beautiful charities that needs their help. This is a socially responsible company, I se! I learned that the White Sand Fragrance also comes in a warm glow candle! That they work with chime for change. I learned that they work with Chime for Change, an umbrella project that contributes to a number of charities. Sounds cool, but I'd like to know more. I enjoy your beauty posts. I like that you always have something to share that is NEW (to me) and not the same old thing that I read over and over on other beauty blogs or sites. I learned that I can use these because there's no coconut! Usually I'm basically dying with the coconut oils and such but these don't use coconut as an ingredient. I learned: Chime for Change is a community of people working to promote education, health and justice for every girl, every woman, everywhere. FINN & CO. believes this is beauty at its best! I would love to try this product,I pretty much like everything on the site. I learned that they work with Chime for Change! I'd also like to try the Black Sand Body Cream. I enjoy the beauty post especially skin care ones. I like the White Sand Body Cream. A perfectly intimate blend. Wonderfully emollient, contains a unique blend of powerful moisturizers. I learned that this company's purpose is to create beautiful and pure products of high integrity and simple luxury. I really love the Black Sand Warm Glow Candle 10 Oz. I learned that Finn & Co. also sells warm glow candles in the White and Black Sand scents. I would like to try the Warm Glow Candle – White Sand. I learned that the company gives to charities. I like the bath salts. I learned they work with Chime for Change. I enjoy family posts and recipe posts.